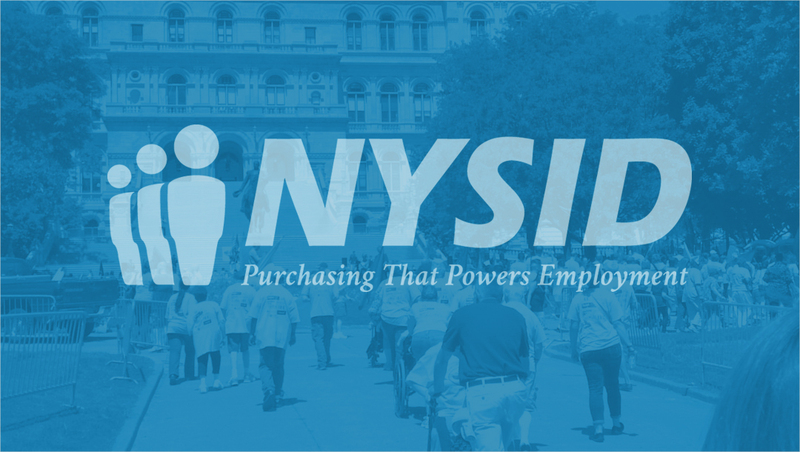 Shari Reynolds - Steuben County Chapter NYSARC, Inc. - New York State Industries for the Disabled, Inc.
Shari Reynolds has been working on NYSID Preferred Source contracts for nearly 20 years, as a member of the Steuben agency's Printers Plus team. She has also worked in the kitchen, on microfilming and janitorial contracts, and in the community. Her overall work goal is to continue to working to earn spending and saving money, while learning good work habits and skills. 'My favorite jobs are registering and putting apparel on the press, but my supervisor says I do good cleaning, too,'? commented Shari. The registration person is the lead member on the screen-printing team, putting the apparel in the proper position on the press and keeping track of production numbers. 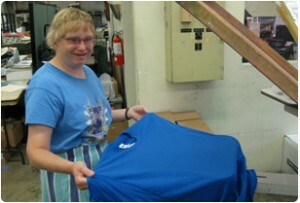 Over her lengthy career, Shari has printed volume of Preferred Source apparel, including golf shirts, hats, uniforms, t-shirts, bathing suits, and outerwear. She strives for accuracy, her attendance and punctuality are excellent, and she is cross-trained in approximately 95% of screen-printing tasks. Shari was nominated as the Steuben agency's 2009 Joslin Outstanding Performer, through NYSID's annual people-centered awards program.